Whether you love the top 40s or enjoy turning up the stereo to listen to classic rock, the Grammy Museum located in Los Angeles is the place for you. The museum showcases various exhibits from today to the past and is historically interesting. Walk through the exhibits, learn more about the creative process, the technology that goes into the recording process and so much more. Read on to see what you can discover when you visit the Grammy Museum. One of the great things about the museum is the exhibits. While there are permanent exhibits, there are also rotating ones so that no matter how many times you visit, there will always be something new for you to discover. One such exhibit that will be up until Spring 2018 is Katy Perry Frock & Roll: Transforming Music and Fashion. Another favorite display is the Michael Jackson exhibit located on the 3rd floor. Here, you’ll be able to see the white suit that was worn on the Thriller album cover, the iconic red leather jacket worn in the “Thriller” music video and never before displayed artifacts! Four floors are filled with exciting exhibits as well as one of a kind artifacts that can’t be seen anywhere else. As you explore all four levels of the museum, you can learn more about the history of the Grammy Awards, the songwriting process of various artists, new music technologies and more. 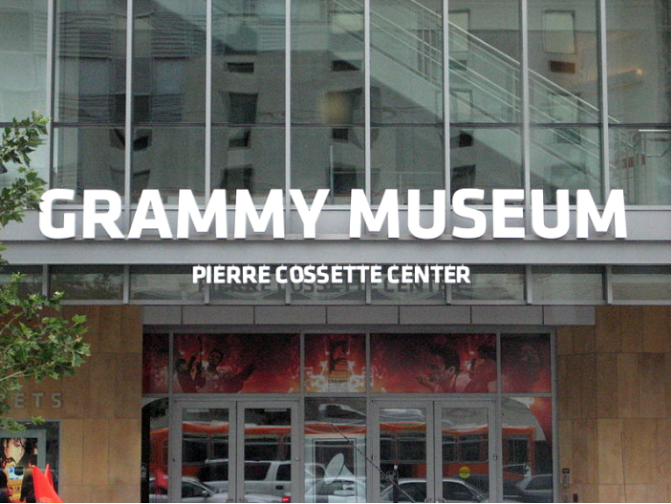 You’ll find the Grammy Museum located at 800 W. Olympic Blvd in Los Angeles. The museum is open Monday - Friday from 10:30 am - 6:30 pm and is open weekends from 10 am - 6:30 pm. General admission is $12.65. If you are a college student or a senior, 65 and older, tickets are $11.95. Youth ages 6-17 and military personnel get in for $10.95. Children 5 and under can get in for FREE. During your trip to Los Angeles, be sure to stop by the Grammy Museum and learn more about the fascinating history of music!